Houses & Homes VA: What you don’t know can ruin your kitchen counter top! What you don’t know can ruin your kitchen counter top! It’s true, depending on what types of countertops you have in your kitchen each one needs to be maintained in order to keep that beautiful luster. More importantly you can actually dull the finish and even damage your expensive counter over time by using the wrong types of cleaning agents. Here is the proper way to care for the 3 most common types of kitchen counters. Granite counter tops are extremely strong and will last a lifetime but special care needs to be taken to preserve their high gloss finish. This is one time where an ounce of prevention is definitely worth a pound of cure! 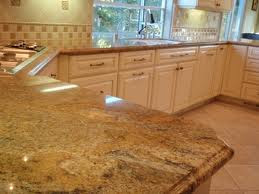 Spills on granite counters need to be wiped up immediately before they have a chance to penetrate the surface. It is also highly advisable that you use coasters when sitting beverages on the countertop. Believe it or not certain acids that are found in fruit juices and some soft drinks can actually dull the granite surface. The best way to clean your granite countertops is with nothing more than warm water mixed with very little dishwashing liquid. Just a few drops will do and NEVER use any type of harsh abrasive or chemical cleaner on the surface. Although strong and durable some cleaners will eventually “wear down” the protective layer that gives the granite that beautiful high luster shine. Just in case you’re wondering the answer is a big NO, this is one time that you can NOT use vinegar to clean with! Be sure to use a soft cloth when cleaning and finish the job by wiping the counter a final time with a cleaning cloth and water only. This will prevent any residue from remaining and give you a streak proof shine every time. Marble counter tops are the easiest to maintain but are much softer and porous than you might think. Marble scratches very easily and is quick to absorb any spilled liquid. Everyday cleaning is as easy as dusting the surface and then using a slightly damp cloth to buff dry. This will instantly restore the shine that marble is so known for. If your counter requires a more substantial cleaning your best bet is to use just a little non-sudsing ammonia on a soft cloth to clean and then buff dry as mentioned above. A commercial marble polish is recommended to restore the surface to like brand new condition if the finish has become dull over time. Again, NEVER use any type of abrasive cleaner, acid based solutions or white vinegar to clean marble. Ceramic Tile counter tops are the most difficult to maintain and clean. Tile counters are available in either a glazed or unglazed surface and both are distinctly different. The smooth glazed finish is very durable but is easy to crack or break and scratches quite easily. Unglazed tiles absorb cleaning products and both types are susceptible to mold and mildew due to the fact that grout is used to hold the tiles in place. The best way to clean the shiny glazed tile is to use a nonabrasive spray cleaner. A clear non-colored window cleaner is a perfect solution. Stay away from the deeply colored window cleaners as this will eventually discolor the grout. If the glazed tile is heavily soiled it is OK to use an abrasive cleaner or powder and it’s best to use a bleaching agent as well if there are hard to remove stains. If this is the case allow the bleaching agent to soak into the stained areas for a few hours and then remove it using a wet cloth and wipe it dry. Unglazed ceramic tile can be cleaned with water and a non-soap detergent or a commercial tile cleaner. Never use vinegar or steel wool to clean either type of tiles. Any acid based cleaner (including vinegar) will cause the grout to decay and crumble over time and steel wool will severely scratch the tile.